The paper tackles the theme of evaluating dynamic load increases that the vehicle transfers to the road pavement, due to the generation of vibration produced by surface irregularities. The study starts from the generation, according to the ISO 8608 Standard, of different road roughness profiles characterized by different damage levels. In particular, the first four classes provided by ISO 8608 were considered. Subsequently, the force exchanged between the pavement and three typologies of vehicles (car, bus and truck) has been assessed by implementing, in Matlab®, the QCM (Quarter Car Model) characterized by a quarter vehicle mass and variable speed from 20 to 100 km/h. The analysis allows determining the amount of dynamic overload that causes the vibrational stress. The paper shows how this dynamic overload may be predetermined as a function of the pavements surface degradation. This is a useful reference for the purposes of designing and maintaining road pavements. A correction to this article is available online at https://doi.org/10.1186/s12544-019-0358-4. The increasing volume of road traffic, the higher vehicle speeds and the increasing axle loads are generally referred to as the cause for the increasing hindrance due to vibrations induced by road traffic. Traffic vibration is mainly due to heavy trucks passing at relatively high speed on a road with an uneven surface profile. Interaction between wheels and road surface causes a dynamic excitation which generates waves propagating in the soil, and impinging on the foundations of nearby structures. At a particular site, the dynamic properties of the vehicle’s suspension system, the vehicle speed and the elevation of the road surface unevenness determine the vibration levels . Heavy goods vehicles and buses are found to produce the most perceptible vibrations. The vehicle models used to describe the dynamic behaviour of a vehicle are composed of discrete masses, springs, friction elements and dampers [2, 3, 4, 5, 6]. When a linear vehicle model is used, vehicle Frequency Response Functions (FRF) facilitate the calculation of the axle loads [2, 3]. Local road unevenness is described by a deterministic function that represents the deviation of the travelled surface from a true planar surface. Global road unevenness can also be described in a stochastic way by a Power Spectral Density (PSD) [7, 8, 9, 10, 11, 12]. The vehicle’s vertical axle loads are composed of a static and a dynamic component. The static component follows from the distribution of the vehicle weight over the vehicle axles. The dynamic component is induced by the road unevenness that subjects the vehicle to vertical oscillations. It depends on road unevenness, vehicle’s characteristics and vehicle’s speed. When the vehicle speed is low, as compared to the wave velocities in the soil, the contribution of the static component to the free field vibrations is negligible. For a 2D vehicle model, only the longitudinal unevenness profile representing the deviation at a point along the road is considered. Road unevenness is measured by two general types of equipment: profilometers, which measure the unevenness in a straight-forward way, and response-type devices, which measure the unevenness in an indirect way, as the dynamic response of the measuring equipment . When the road shows discrete or periodic irregularities, such as joints, potholes, or cracking zones , a description by a PSD is not suitable. The generation and propagation of the vibrations produced by traffic are therefore extremely complex and potentially dangerous phenomena, especially in urban areas due to the presence of historical buildings. To prevent vibrations to damage these buildings and ensure compliance with the safety conditions, a deep understanding of the problem is necessary. Therefore, it would be very useful to identify the link between road surface characteristics, types of traffic vehicles and consequent evolution of the aforesaid vibrational phenomena. The main objective of this study is therefore to identify this link. Given that the contribution we want to provide is exclusively linked to the qualitative analysis of the problem, the Authors devote special attention to the methodology concerning the complex phase of analytical modeling, developed in accordance with ISO 8608 [9, 14]. The ISO 8608 norm, dealing with the classification of road surface profiles, is based on a comparison of the measured, single-sided PSD and eight categories labelled from A to H, defined by a range of artificial PSD. It is indicated in the ISO 8608 norm that the profiles can be used as the input for theoretical parametric studies. The paper is structured in a first theoretical part, in which the concepts underlying the classification of road profiles according to the ISO 8608 are synthetically included. The second part of the paper is dedicated to the modeling of vehicles with reference to the Quarter Car Model (QMC). In the third part of the paper, the operational phase of the study is developed, in which the road profiles taken into consideration interact in Matlab® environment with appropriate categories of vehicles (cars, buses and trucks). In this way, it is obtained the extent of the dynamic overload in relation with various operating variables, such as types of vehicles, their speed of transit typology of the road profile, etc. These results are summarized in diagram form, and allow developing interesting considerations on the generation and extent of the vibrational phenomenon. Fundamental concepts in ISO 8608 are spatial frequency, road profile and PSD. Spatial frequency is defined as (cycles/meter), contrary to the ordinary unit Hertz (cycles/second). Road profile is the variations in height of the road surface measured along one track on, and parallel with, the road. PSD is Power Spectral Density. The use of ISO 8608 is based on the assumption that a given road has equal statistical properties everywhere along a section to be classified. That is: the road surface is a combination of a large number of longer and shorter periodic bumps with different amplitudes. The combination is the same wherever one looks along the road section . The ISO 8608  describes the methodologies to be used for the generation of the road surface profile, by implementing two different procedures from data measured on site. The first provides a description of the road roughness profile through the calculation of the PSD (Power Spectral Density) of vertical displacements Gd, both as a function of spatial frequency n (n = Ω/2π cycles/m) and of angular spatial frequency Ω. In practice, on ordinate both Gd(n) and Gd(Ω) are plotted in function of n and Ω with log-log scale. The ISO 8608, in order to facilitate the comparison of the different road roughness profiles, proposes a classification which is based, as already stated, on their PSD, calculated in correspondence of conventional values of spatial frequency n0 = 0.1 cycles/m and angular spatial frequency Ω0 = 1 rad/m. Assuming for Gd(n0) and Gd(Ω0) the values established in ISO 8608 (see Table 1), eight classes of roads are identified: from class A to class H. By comparing the Power Spectral Density associated with the various classes, we can deduce that class A include roads that have a minor degree of roughness and, therefore, for the purposes of the production of vibrations can be defined of the best quality. Conversely, in class H are included all roads that have a high degree of roughness and can therefore be regarded as very poor. The identification of the class of a real roughness profile measured on site is assessed by calculating the Power Spectral Density of the real profile in correspondence of n0 and Ω0, and then comparing it with those appearing in ISO Standard for the various classes. where the values of Gd(n0) and Gd(Ω0) must be derived from Table 1 on the basis of the considered road class [9, 10]. For practical applications, in agreement with the ISO road roughness surfaces classification, it is possible to generate an artificial road profile from a stochastic representation, in terms of the function of Power Spectral Density (PSD) of vertical displacements obtained through the Fourier Transform of the auto-correlation function of the stochastic process describing the road profile. where Ψx2 is the mean square value of the component of the signal for the spatial frequency n, within the frequency band Δn. with i varying from 0 to N = nmax/Δn. where: x is the abscissa variable from 0 to L; Δn = 1/L; nmax = 1/B; N = nmax/Δn = L/B; k is a constant value depending from ISO road profile classification, it assumes integers increasing from 3 to 9, corresponding to the profiles from class A to class H (see Table 2); n0 = 0.1 cycles/m; φi random phase angle following an uniform probabilistic distribution within the 0–2π range. The vehicle passage on irregular road pavement surfaces generates the oscillation of the vehicle mass, with a consequent increase of the load applied on the pavement. The load which a vehicle axle transfers on the pavement surface is not constant in time and space, but is variable in function of several factors such as: vehicle mass, speed, suspension type, road surface irregularities, etc. It is clear that the produced dynamic force is responsible for the generation of vibrations in road pavement. These vibrations are diffused through the foundation ground, and then to adjacent buildings. For practical purposes, the QCM (Quarter Car Model, see Fig. 1)  is the vehicle model that can effectively be used to study the dynamic interaction between vehicle and road roughness profile, and therefore in the study of vibrations generated by road traffic. By combining the masses values m, the stiffness constant k and damping c of the QCM, it is possible to model any type of road vehicle: car, bus or truck. The vehicle behaviour along a road section with uniformly distributed roughness is determined by the study of the model forced oscillations. where: N is the amplitude of dynamic overload; Ω is the system pulse; kt is the tire stiffness; h = h(t) is the displacement imposed by the road roughness profile; y = y(t) is the displacement of the mass mu; H is the amplitude of harmonic forcing h(t) = H⋅cos(Ωt); Y is the amplitude of the displacement y(t) = Y⋅cos(Ωt). During the simulations, a road section pavement of length equal to 250 m was considered, and its roughness profile was reconstructed (see paragraph 3). The spatial frequency was considered in the interval between 0.004 and 4 m−1. In this way, it has been possible to generate, through the application of Fourier series, the road surface profile of the pavement by applying the Eq. (9). The ISO classes of considered profiles are A, B, C and D corresponding to the limit value k = 6 (see Table 2). Beyond that value it is reasonable to assume that the road surfaces are characterized by a damage degree high enough that they require being travelled at very low speeds, and are so unsuitable for the safe transit of vehicles. Random generated profiles are shown in Fig. 2. After generating the road surfaces profiles characterized by different damage degrees, the next phase of the numerical simulations focused on the determination of dynamic loads transmitted to the ground by the vehicle. Three types of road vehicle (car, bus and truck) were considered. The dynamic load, produced by the passage of these vehicles travelling at different steady speeds (20, 40, 60, 80 and 100 km/h) on the progressively degraded road surface, was calculated from the solution of motion equations of QCM system at two of freedom (10) and characterized by the dynamic parameters shown in Table 3. The vehicle travelling at a fixed speed, stressed by the road roughness that meets along its route in the areas of contact between tire and road profile, generates the actions that result in a vertical oscillating motion of the vehicle with respect to its suspension system. Consequently, dynamic forces are developed which stress user, vehicle and road pavement. This produces discomfort and mechanics fatigue in the vehicle’s bodies, but also vibrations that, through the wheels, are propagated to the road pavement, in the foundation ground and then to adjacent buildings. The developed Matlab® code has made it possible to define the behaviour of the dynamic load for the various vehicles travelling at chosen speeds on the different road surfaces profiles generated. For example, Figs. 3 and 4 show with alternative representation, for the profile of ISO class A-B (good road surface), the behaviour of the dynamic load produced by different vehicles travelling at the speed of 20, 40, 60, 80 and 100 km/h. It should be noted that the graph trends of the dynamic load were determined by analytical solving of QCM equations of motion (10). To verify the goodness of these trends, it was carried out a numerical solving of ordinary differential equations system (10). The software Matlab® has specific functions dedicated to the numerical solution of Ordinary Differential Equations (ODE). Exploiting the potential offered by the software, the solution previously obtained by analytical means has been verified. The results obtained by numerical verification are entirely congruent to those obtained by analytical means. Figure 5 shows, for each type of considered vehicle and at speed of 40 km/h, the behaviour of the dynamic load, varying the road surface profile (see Fig. 2) from very good (ISO A-B class, with hmax = ±15 mm), to good (ISO B-C class, with hmax = ±25 mm), average (ISO C-D class, with hmax = ±50 mm), and poor (ISO D-E class, with hmax = ±100 mm). The implementation of the Eq. (12) has made it possible to determine in dimensionless form the amplitude N of the fluctuating part of the vertical force. Figure 6 shows the trends of N/(kt⋅H) as a function of frequency for the three considered vehicles, characterized by the parameters of Table 3. For the same type of vehicle, an increase in speed was not found to correspond with a substantial increase in the load transmitted to the road pavements (see Fig. 4). The longitudinal regularity of the road surface appears to be the dominant factor (as shown in Fig. 5), while the increase of vehicles speed has got a much lesser influence on the generation of vibration. This means that the travelling speed changes only the manner in which the road roughness profile is “read” from the vehicle, changing the frequency content of the excitation at the base of the vehicle. Certain values of speed can determine resonance conditions in the dynamic interaction vehicle-road profile. In addition, frequency for the vertical motion of the vehicle body (sprung mass), are located in a range of values between 1.5 and 4 Hz, while the wheel (unsprung mass) moves vertically with greater rapidity and its frequency (from 6 to 10 times larger) is approximately equal to 10 Hz. Because of this significant difference of frequency, the motions of vehicle body and of wheels are almost independent. In addition, since the vibration modes of the wheels are generally quite damped, they scarcely contribute to the total response, in terms of dynamic overload transmitted at the road pavement. The influence of the vehicle type is significant and easily detectable by the analysis of Fig. 4, in particular. The magnitudes of the load generated by the three types of vehicles are significantly different. In fact, on the same road surface profile (e.g. poor - ISO D-E class) and speed (e.g. 40 km/h), the peak of dynamic load produced by a car is approximately 1.0⋅104 N, for a bus is around a value of 1.2⋅105 N, while for a truck is approximately twice that of a bus and equal to 2.1⋅105 (see Fig. 5). Heavy traffic, when the irregularities of the road surface evolve toward significant values of deterioration, generates a considerable dynamic overload, closely connected with the accelerations of the great masses of trucks. Road infrastructures, and therefore vehicular traffic flow, in many cases, develop near historical buildings, with artistic and architectural values. Inevitable consequence of the dynamic interaction between vehicle and road pavement is the production of vibrations that can cause damage to buildings structures. 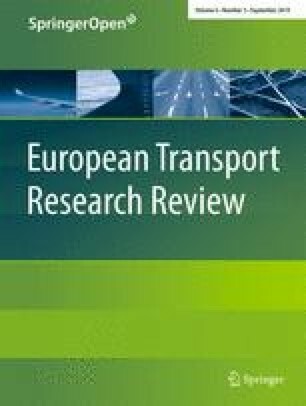 In this context the Authors have addressed the issue of evaluating the increases in dynamic load that vehicles transfer to the road pavement due to the generation of vibrations induced by surface irregularities. The Matlab® analysis and the developed comparisons allow quantifying the vibrational stress level that can be predetermined as a function of: degradation of road surface, speed and type of vehicle, with implementation of appropriate calculation procedures. The results show that the generation of vibration fundamentally depends on the longitudinal regularity of the road surface and only to a much lesser extent on the vehicles’ increase in speed. In addition, certain values of speed can generate conditions of resonance in the dynamic interaction vehicle-road profile. From the comparison between frequency of sprung mass motion and of wheels (unsprung masses) motion, it is clear both the significant difference of these frequencies and the almost independent vehicle body motion from wheels motion for all the examined vehicles. The observation that wheel vibration modes are quite damped makes clear that the contribution to the total response, in terms of dynamic overload transmitted to the road pavement, is very small. On the other hand, the influence of the vehicle type is considerable, and in particular heavy traffic causes an appreciable dynamic overload, especially when the road surface irregularities are increased. In conclusion, the paper provides a useful methodological contribution to the determination of dynamic effects caused by the interaction vehicle-road pavement, by evaluating the entity of the dynamic overload induced by surface irregularities. The consequences of this dynamic overload should then be the subject of further studies to determine the transfer mode and the damage level produced on buildings situated near to the roads. It is hoped that these studies will be well-funded by the competent authorities in order to develop strategies and techniques useful to safeguard the integrity and preservation of the buildings situated in the proximity of road infrastructures. The operational phase of the study was implemented with the software MATLAB® because it is a high-level language and an interactive environment for numerical computation, analysis, and visualization of data and programming. The files containing MATLAB® language are called m-files, also said “MATLAB® codes”. After the creation of an m-file, that file can be used as a command or a MATLAB® function.